Wondering how to get rid of dandelions? Want to kill those rouge dandelions infesting your pristine lawn today? Let the lawn care guide help you in your quest for the best looking lawn. Dandelions are some of the toughest weeds to control because of two main factors. 1. Kids love to pick them up and blow 100′s of seeds into your grass. The wind will pick these seeds up and carry them across your neighborhood infesting everyone with their share of dandelions. It won’t take long for these seeds to propagate and the cycle to start over. That’s right. The majority of those seeds will find their way to fertile soil and sprout a 10″ taproot. If you try pulling this taproot it will likely fracture leaving just enough in the ground to regenerate another pesky dandelion. So now that you know a little about the dandelion lets talk about the best ways to control and kill them. Attempt to pull your dandelions after a good hardy rain or heavy watering. This will facilitate loosening up the soil around the taproot and make it much easier to get the entire taproot out. Using a knife, screwdriver, or fancy dandelion pulling tool make a small incision next to the base of the dandelion. Wiggle your chosen tool around to loosen the soil. Ruffle up all the leaves around the dandelion and use them as a handle. Apply even pressure, wiggling the dandelion. If its not moving use your tool to loosen up the soil a bit more. Eventually, the dandelion and its taproot will come out cleanly. If you’re lawn is riddled with dandelions and pulling them isn’t an option you’re interested in you better consider a herbicide before they really get out of control. Killing dandelions is only going to get more difficult, if you don’t get control of them. Fortunately dandelions are a broad leaf weed and there are some really easy herbicide solutions like Weed-B-Gone. 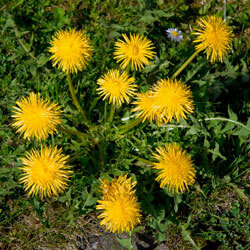 Weed-B-Gone will not only take out dandelions but any broad leaf weeds you may have. Depending on the number of weeds you have you can spot treat or use a hose attachment to cover large areas. If you’re looking for a natural alternative to herbicides, you might consider vinegar. The acetic acid in vinegar is what kills the dandelions or other broad leaf weeds. The problem is you may need to boil the vinegar down to make it potent enough to actually kill the weeds. It may also pay to shop around as different vinegars have different levels of acetic acid, so read the label. The last herbicidal solution is roundup. Roundup and vinegar will kill anything it touches so be careful not to get it on surrounding grass or garden plants. The Weed-B-Gone is selective only targeting broad leaf weeds and is the most popular choice when killing dandelions in your lawn. The healthier your lawn, the less weeds you’ll have. If you’re already in a situation where you have dandelions in your lawn, apply your selected method to kill the dandelions. Apply your herbicide a 3 days before you plan on mow your lawn. The bigger the dandelion the better, so the surface area is maximized. The 3 days gives it plenty of time to get the herbicide into the root system to guarantee you’ll never see it again. Once you get rid of your dandelions and you want to keep them from coming back next year, apply a broad leaf weed control in the early fall. Normally dandelions die back during this time and all the nutrients in their leaves are transfered to their root system. Remember this is not only good for dandelions but all broad leaf weeds, so it really helps even if you don’t have a weed problem today. we have a ton of dandelions in our lawn. we sprayed round up which killed a good majority of them. should we pull the dandelion out of the ground after it is dead or leave it? we have a ton of dandelions in our lawn. we sprayed round up which killed a good majority of them. should we pull the dandelion out of the ground after it is dead or leave it? what is the best herbicide to use? Is weed b gone safe in flower bed? Wonderful blog! Do you have any tips for aspiring writers? Would you recommend starting with a free platform like WordPress or go for a paid option? There are so many options out there that I’m completely confused ..
On va dire que ce n’est guère erroné !!! Dandelion leaves provide off the charts nutrition so one way of dealing with them is to eat them.Put them in a salad. Make dandelion wine. They also provide pollen for bees early in the year. Also I’ve seen Goldfinches eat the dandelion flower once they’ve gone to seed. I would not use herbicides to kill plants. I easily control dandelions by using a dandelion digging device ($4 at the hardward store) and they are very easy to pull after a rain. Catch them early and they will have a 2 or 3 inch taproot — not 10 inches. The major difference between having a face lift vs.
looking better. Information You Should Know About Plastic Surgery is another excellent instance of this. Wonderful goods from you, man. I have consider your stuff prior to and you are just extremely excellent. fdom you. Thhat is actually a tremendous web site. by the North American session and then back to the Asian session, excluding weekends. with by the merchant or online store you are promoting. in time jail for anything over parking tickets. These are two large businesses that could be recognized universally throughout the online community.